As expected, I had same issue with GRUB2 on Debian-based system and Mageia. They don't live together. It means GRUB2 put incorrect records for Mageia part of menu, being it Debian itself, Ubuntu or, this time, Kubuntu. If boot the Mageia Linux straight away, the result would be the kernel panic. And then... I don't want GRUB2 in Kubuntu, I want it belong back to Debian. And only after all these steps I decided to do the first boot of Kubuntu 11.10. When installed from Live run, different systems behave themselves differently. In particular, some of them remember configuration steps from Live run, so you can flawlessly continue your work. Others leave you with fresh system. Mageia 1 was from first category: it remembered wireless driver which I activated in Live run and even configuration for WiFi connection. I have not done anything else before installation of Mageia, so could not check more. But even these steps were very nice bonus. As opposite, Kubuntu 11.10 is from second category. Freshly booted system did not remember WiFi connection details used just now during the installation. I had to configure connection again. That's not bad, but just a little bit annoying. Naked freshly booted Kubuntu 11.10 operating system took about 340 Mb memory, which was quite a lot compared to other distributions. Even though after some manipulations I was able to reduce size to around 290 Mb, this was too much compared to Mageia 1 with its 170 Mb. Unfortunately, my favourite browser Google Chrome did not install in Kubuntu 11.10, same as in Ubuntu 11.10. And again, Chromium was successfully installed from repository which is very good alternative. After considerable time of usage I have not found any functionality deficiencies in current version of Chromium compared to Chrome, which was a case few months ago. As I have previously mentioned, there is only one Desktop wallpaper included into Kubuntu 11.10 by default. But there is a button "install default wallpapers". I used that button and it brought me more options. Plus, of course, there's an option to browse even more. Desktop wise, I'd like to note another issue which I noticed. Opacity of panel? For me - it looks strange... To sort this out, I switched off desktop effect Blur. It improved situation slightly, but not in full. By the way, I have not seen this opacity in Live version of Kubuntu 11.10. 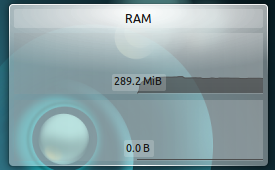 There are some desktop effects enabled by default, but not too many. I'd say that approach is very balanced. For my taste, I got just enough eye candy without overbloating the system and reducing performance. To check effects which are not on by default, I activated Desktop cube. Of course, it worked without issues. I have already mentioned in my Live run that Kubuntu 11.10 has two package managers included: Muon Package Manager (MPM) and Muon Software Centre (MSC). Which one to use? Of course, MSC is more colourful and nice to work with. But it only allows you to process (install/uninstall) one application at a time. As opposite, MPM allows you to select all the packages you need and then install them in one go, being slightly less visually nice. Of course, when you first install your favourite tools right after system installation, I would recommend to use MPM, as I did. Later you can use MSC for better graphical design. Installation of my usual tools in Kubuntu 11.10 went OK: VLC, Qutim, Skype, smbfs were installed without any particular issue. I had small problem with Qutim during its first run. For whatever reason it did not want to connect to GTalk account. But luckily it sorted itself after system restart. Of course, MP3 and Flash worked for me in Kubuntu 11.10 out of the box - checkbox was ticked during the installation. 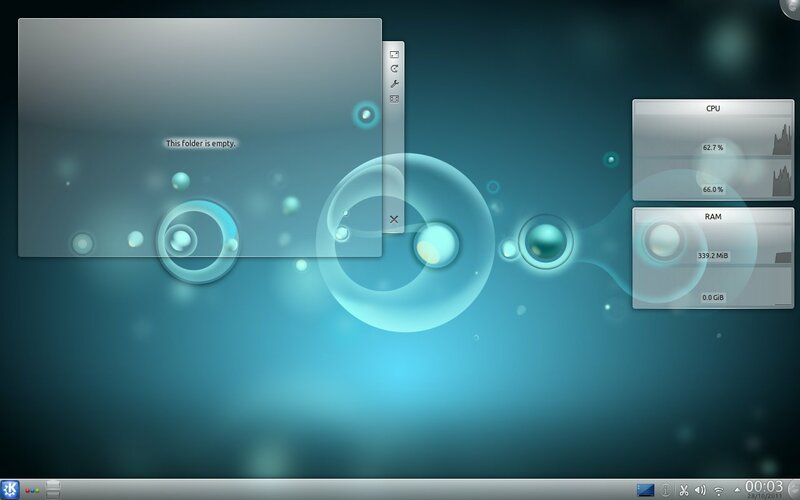 As you can see from here, everything was nice and shiny for me in Kubuntu 11.10. I started to fall in love again. But suddenly things have changed to opposite. The cloud was very small initially. I wanted to download something from FTP resource. Of course, I could use Chromium or even Midnight Commander built-in tools for that. But for whatever reason I decided to go for specialized FTP tool. I found several of them available in Muon Software Centre waiting for me. My first attempt was for KFTPgrubber. Why? Because it is KDE-native tool, which would require minimal download and would look pretty integrated in Kubuntu. Installation was successful, but after all approaches it did not want to connect to the remote server. Chromium connection was OK at the same time. OK, if KDE-native tool has an issue, then all-trusted FileZilla should work. You could think so. But instead FileZilla did not start at all! Few seconds of jumping cursor and then... nothing! Not even a farewell note in dmesg. Then another issue was found. And this was already a sign of thunderstorm. My Kubuntu 11.10 did not want to reboot itself when remote partition was mounted via CIFS. The issue was still the same as I saw in Kubuntu 11.04 and which drove me away from (K)Ubuntu. Operating system shuts down wireless network connection before unmounting the remote partition. Then it waits for 5 minutes before unmounting command times out. Strangely enough, Ubuntu 11.10 did not have this issue when I tried it! And finally... Tornado came in and crushed the system. After some attempts to run FTP client, after few reboots with hanged CIFS partition, Kubuntu 11.10 stopped properly boot. Connection did not restore automatically. Attempts to manually restore connection hanged the system and it was only responsive to Ctrl-Alt-Backspace combination. But even that one was not a solution, because restart of X-server brought KDE to black screen without any signs of life on it. Thus, Kubuntu 11.10 became unusable. At least for me. At least now. It still remains in my heart as (almost) first love... But it won't remain on my hard disk. Do you want to try Kubuntu 11.10 yourself? Then why not order a CD with this distribution via Buy Linux CDs service? Don't want Kubuntu? Check it out, there are plenty of other distributions too! Something weird (or wonderful) happened! After few days when I left Kubuntu 11.10 untouched on my laptop, after few days of this post being published, I decided to boot into this Operating System again. And it works! Network connection is fine. FTP download via FileZilla is fine. Did anybody make any magical spells or shaman dances remotely? Automatic network connection: configuration of connection lacked relevant checkbox. Once it was ticked, connection was restored automagically on reboo. 5-minutes timeout for network partition unmounting. Solved with 2 lines of commands suggested by Elder Geek. Second day of tests showed that timeout on network partition unmounting still exists. This issue was not solved. The package manager (Muon) failed me a number of times. Had to kick it out and use Synaptic. or you could use like you said Filezilla which is running perfectly on my setup, and smb4k is a program to help you mount samba shares in linux, which is just great! Sorry to hear. I was pretty much happy with Muon. It was pretty much stable for me. Better than some other places. There are many other ways to connect to FTP server from Kubuntu. I mentioned some, you mentioned others. Thanks for that. But, as I mentioned, I wanted to use standalone tool like KFTPgrabber or FileZilla. They did not work. The reason? I don't know. And I can't investigate further because system became unusuable now. I'll not boot into it and will replace with something else soon. CIFS partitions are in my fstab tool. There is a small difference between mounting them via fstab and via smb:/ in Dolphin. Difference is in performance and in ways to reach that partition from different applications. Not all of them use KDE-native (Dolphin-based) navigation. That's why fstab is more consistent. Also, adding single line in fstab diminishes requirement to install separate package (smb4k). The grammar in this article made my eyes bleed. Please fix it. Please edit it and send back. You're welcome to become my permanent editor. Well I have unfortunately found in my experience that Kubuntu is the most cobbled together kde distro out there......I have used fedora, debian, LMDE, opensuse. And all of them were way more solid and less buggy than Kubuntu.......Its a real shame too because it could be such a good distro but the whole release every 6 months bugs or no bugs thing took its toll on me. @DarkDuck I always love your reviews and your views on software. I am a native english speaker and can vouch for the fact that your writing is at least as good as mine. Keep up the good work. I am sorry that Kubuntu is being so naughty. My wife owns an Acer Aspire One 722 and Kubuntu 10.10 has been the best distro yet for running on it. Have a better one my friend. Instead of suggesting that others should lose their time fixing your crappy grammar, just show seriousness and try to learn the minimum basics of the language you are trying to use. Very clear. I understood everything you had to say and it was an easy read. I am English and can attest that your writing skills are far beyond what would be expected for a secondary language. Actually far better than many English speaking people I know. I have tried Kubuntu several times in past few years and find that it never quite lives up to my expectations. I have recently been using Linux Mint 11 and Linux Mint Debian rolling edition and would recommend either. The Mint folks have done a great job at putting together very attractive and productive desktop distributions. Let me disagree. Kubuntu is pretty good. I have not tried Mint KDE, so can't comment. But I tried OpenSuSE and Fedora. They are less polished from my perspective, especially SuSE. You may be also interested in voting results where readers voted for their favourite KDE distros. Kubuntu is a leader, together with OpenSuSE. I cannot try this, because my current Kubuntu does not boot. Should I reinstall the OS to get this tested??? It is more weird that Ubuntu 11.10 does not have this issue. Is it somehow linked to KNetworkManager? I am not going to argue with you about my language here. I have passed IELTS test with 7.5 points. Enough for UK Government to accept my English as passable. What is your score? Until I see your (and anyone's who wants to challenge my English) score, I will delete all comments like this. Without replies and without traces. I am sorry I can't share your excitement about Mint. I have different opinion about this team. But that's my own. @DarkDuck Yeah, I know that your current Kubuntu setup is broke. You would need to reinstall (or really troubleshoot) to get kubuntu to work. THen you could try my fix. As for Ubuntu. It could be in a dbus rule, or a K* file in /etc/rc0.d or /etc/rc6.d. This ia a large problem with wireless than it is with wired connections. Something weird&wonderful happened. 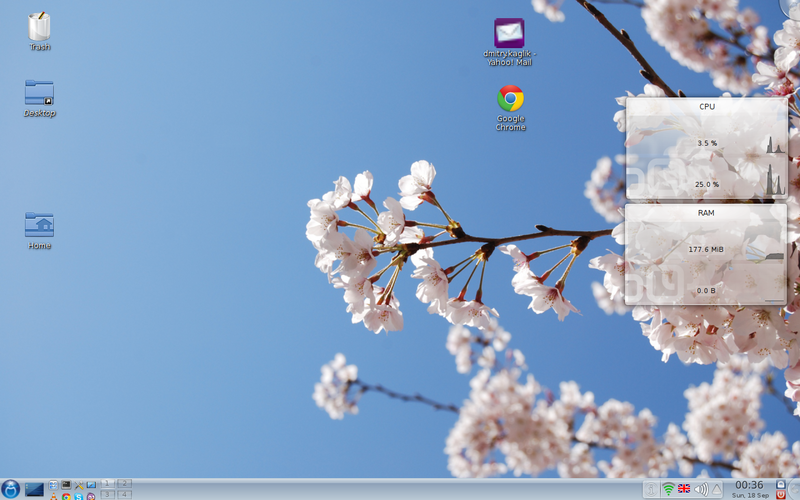 I am in Kubuntu 11.10 right now. I have updated the post. I tested your recommendations about network partition. It works. Also, I sorted issue with absence of automatic network connection. Corresponding checkbox was not ticked in the connection configuration. I don't remember if I unticked it, so maybe a glitch. That is so excellent. I wish you all the best with Kubuntu 11.10. My wife's Aspire One 722 did not like Linux...until it met Kubuntu 11.10. Kudos to the Kubuntu Team. They do an excellent job with the resources they have. And Kudos to Canonical/Ubuntu for the support the give Kubuntu. I am thinking... If I replace KNetworkManager with something else, for example Wicd, would it help? Thanks for a great article. Please ignore the idiots who don't like your English - I wish my Russian was as good. I recently switched to Ubuntu after doing something really stupid and accidently deleting all the desktop files in LinuxMint 11. Ubuntu was very laggy for me, with both Firefox and Chrome browsers crashing or locking up on flash sites and videos. Looking at plugins within Firefox showed Ubuntu Unity menu extensions - which makes no sense since Unity is not installed that I know. After uninstalling this extension, then purging all Unity menu helpers, everything was much faster. Now there is no window lag and my browsers never crash. Everything is more stable! Thanks for advice for very unusual way to speed up Kubuntu! I wonder why Unity components are still in this distribution. I got the help from Kubuntu forums for the fix, but no answer why there is a Unity extension for Kubuntu. Kubuntu comes with Rekonq browser. Does it mean you first installed Firefox which in its turn dragged all Unity-related stuff? 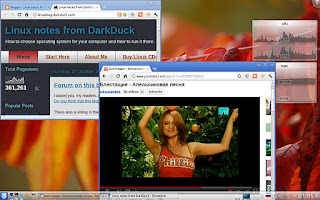 @DarkDuck - I did download Firefox, so maybe Mozilla bundles it with the Linux download.I should have realized that. But very strange that they would bundle Unity menus with Firefox. Thanks for warning! Have you raised a bug report about this? If you downloade Firefox from Ubuntu repositories, it could be job of Ubuntu team which "bundled" Firefox with Unity add-ons. Hi wanted to let you know that I enjoyed your article. I would like to know what issue you had with Chrome install, as I downloaded it before reading your article and it installed with errors. This is a new install, I spent the whole day installing and reinstalling different versions of linux. You're luckier than I am in terms of Chrome installation. May it be that Google found and fixed the error in installer? I have been using Kubuntu 11.10 since it came out. I agree with you all about it being the worst distro. moving from 9.04. My challenge now is that muon has disappeared from the 'computer' tab, my printer configuration in system settings and my printer applet in the task bar, leaving me unable to print. I came upon your blog looking to see if anyone else had these issues and found DarkDuck's article about 11.10 very interesting. I was an Unix specialist in my younger years (SCO) and loved it so when I found Red Hat and Mandrake and other Linux distros I immediately fell in love. The marriage came about when I tried Kubuntu and from then I was hooked for life. The challenge now, is with the issues in 11.10, do I try another Linux distro. I keep fighting issues and not getting much work done. I now have three printers that won't print. HP Deskjet 1660 and HP Deskjet 2050. I have not used Kubuntu for a while now. If you want to try something different, then you can go to Debian with KDE. Either stable of Sid. Also, the poll shows that OpenSuSE KDE is also a popular OS. But that's not my choice by many reasons. My KDE system for last ~8 months is Mageia.